I admit it freely - I am focused, determined, not afraid to work hard. That also makes me obsessive and prone to over doing things, working myself into exhaustion. So today I choose to let go of a few things. I am facing more health challenges, although initial appointments have given me hope for treatment, if not cure. I thank my lucky stars I am Canadian with our universal health care. Having medical care I can count on that won't bankrupt me (in spite of some American politicians who keep insisting Canadians flock to the US to 'steal' health care) means I can put my trust in my doctors although I do inform myself and advocate for my special snowflake-ness. I have also chosen to let go of a few other things that were causing me stress and put my faith into the hands of some others I also trust. I still have to work on the instructors/workshops/seminars, but after three days of concentrated focus on that, I feel I have crafted a well rounded list of instructors and topics. Of course not everyone will find something of interest - that is the nature of planning such a large event. But I have done my best, drawing on my decades of experience in the field, choosing people I feel will do good presentations - and be fun as well. Because if we aren't having fun, I think we are missing the point. I have shown this diagram before but, well, here it is again - as an illustration of how the brain needs to toggle between many factors in order to create whole cloth from individual threads. Recently I learned of a new book by David Eagleman and Anthony Brandt on creativity called The Runaway Species. I've read a couple of Mr. Eagleman's books on the brain so I was intrigued with this one, addressing creativity specifically. As a life long creative person, fascinated by how people come up with the things they make, I immediately put it on my library request list and it came in last week. I want to just quote the entire book to everyone but that would not be possible so I will share this one paragraph (out of so many) and urge everyone to also read this book. "We've all seen models in which the brain is presented as a map with clear territories: this region does *this* while that region does *that*. But that model ignores the most important aspect of human brains: neurons connect promiscuously, such that no brain region works alone; instead, like a society, regions work in a constant hubbub of crosstalk and negotiation and cooperation. As we've seen, this widespread interaction is the neurological underpinning of human creativity. Even while particular skills can be restricted to local brain regions, creativity is a whole-brain experience: it arises from the sweeping collaboration of distant neural networks. As a result of this vast interconnectedness, human brains apply the three Bs to a wide range of our experiences. We constantly absorb our world, crunch it up and release new versions." Today I am sitting at my desktop trying to get my brain focused on the next round of edits for The Book. The manuscript currently exists as approximately 130 pages with more photos, diagrams and the projects and their accompanying notes to be added. It is looking like around 200 pages 'finished'. I am exploring publishing options - perhaps digital with an on-demand print option. But first - I need to finish this round of edits. Now where did my round tuit go? The above photos are four of the 8 tea towels/table centres currently listed on my on line shop with more to come next week. I'd just like to remind people that prices include free shipping to the US and are listed in those tiny Canadian dollars. Therefore a 'bargain'? Interweave Press is also having a huge sale. It looks like my DVD on wet finishing is currently out of stock, but the video download is on deep discount as are both DVD and video download of The Efficient Weaver. They even have the webinar on fibre characteristics on at half price. Or did as of this morning when I last checked. Since this year's craft fair season wasn't as...brilliant...as I would have liked, I am exploring other options for income. Some independent authors/teachers are pursuing the Patreon option, but I'm not sure I can effectively manage that, especially in the run up to the conference in 2019. So I am exploring the possibility of monetizing this blog. I have been offering free advice via this blog since August of 2008. Adding pertinent advertisers will, I hope, be acceptable to my readers. If not, I hope people will be able to ignore them. So - don't be surprised if you suddenly see ads appearing. I will do a trial of three (?) months and see if it is worthwhile. Google says you can opt out again anytime. Of course it probably means more robo calls from Google - the most annoying part of being a small business. But I have finally decided to give it a try and see if it is acceptable to me and my readers. In trying to get more organized and make my studio more functional, what was chaos now feels like an endless job of moving boxes and bins from here to there and back again. 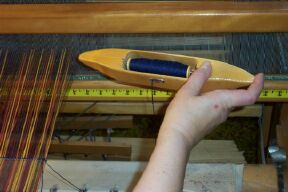 One of the routine discussions that goes round the weaving world is that of how to hold the shuttle. "What is this “ideal shoulder position,” I speak of? Lucky for you, the ideal position of external rotation can be demonstrated by standing (or sitting) up straight, imagining that there’s a pencil between your shoulder blades (scapulae), and you’re pinching your scaps together to keep the pencil from falling. Lift your arms directly in front of you, make a fist and lock your elbows. Rotate your thumbs so they’re pointing towards the ceiling; you are now externally rotated at the shoulder (pictured below, ignore the arrow for now). This is an ideal position. Alternately, flip your thumbs towards each other then down towards the ground; you’re now internally rotated at the shoulder. This is bad." 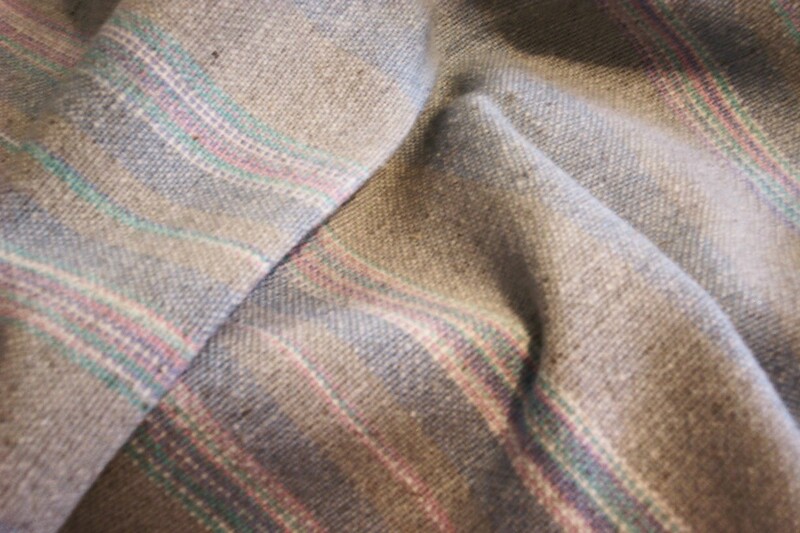 I have been weaving, production weaving, in other words many hours nearly every day, for 40+ years. I have two whiplash injuries, so my neck is compromised as well as my back and shoulders. 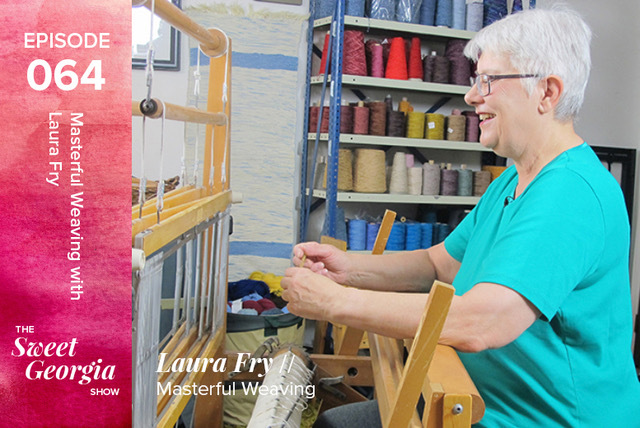 And yet, and yet, I can still weave for 3 (or more) 45 minute sessions every day, holding my shuttle as shown in the photo above. Over the years I have consulted with various professionals - chiropractor, massage therapist, physical therapist, dance instructor who holds a degree in movement. All, every one of them, says the thumbs down position is 'bad' for the body. Maybe not today. Maybe not tomorrow. Maybe not ever! But for those people who are already compromised in their neck, shoulders, back, I strongly urge them to try holding the shuttle in the manner pictured above. It helps with wider warps insofar and you can more easily propel the shuttle across a wide warp. It helps with shoulder issues (especially if you have a tendency to rotator cuff problems) and I feel a smoother rhythm can be achieved much more quickly. In the end, however, if you are happy with what you are doing, no need to change anything. But I do suggest that if you hold the shuttle thumb down that you take frequent breaks. 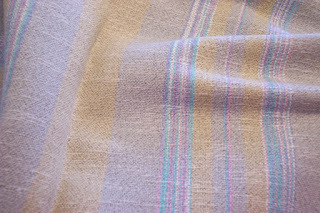 And if you only ever weave for 15-20 minutes at a time, the thumbs down position may never cause any grief. Stephanie Pollack has brilliantly summed up Life. 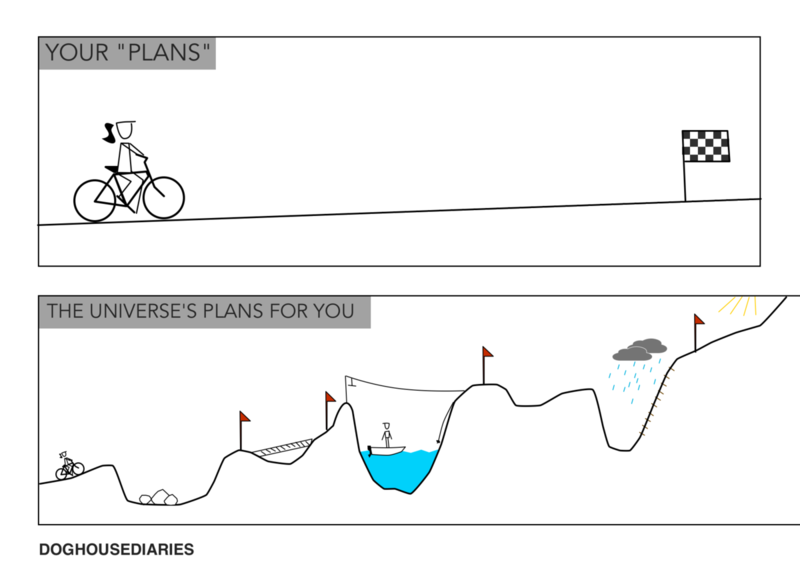 I am a plan maker, a deadline meet-er. I purposely set up my life with goals I want to obtain, in a time frame that I need to work towards, pretty much daily. Having goals and deadlines gives me the adrenaline I need to get out of bed every morning and hie myself to the studio. With the craft fair season not quite as lucrative as I'd hoped, and debts higher, I have been kind of scrambling around trying to come up with a plan. Or three. Or more. First - sort through the left over inventory, get beauty shots, list on my on-line web shop (via Circle Craft) Today I will select the first items and try to get good photos although the light is pretty dull today so it may have to wait until tomorrow. Weave the order of a dozen place mats I got in Vancouver. Again - won't finish today, will aim for tomorrow. Simmering in the background is a commitment to write up my part in a joint project, do the 'final' edits for The Intentional Weaver (so far), submit a proposal to Handwoven. People have no idea how much work it takes to be a professional artisan/teacher/author. I need my daily deadlines/goals to keep me heading in the direction of my ultimate objective. 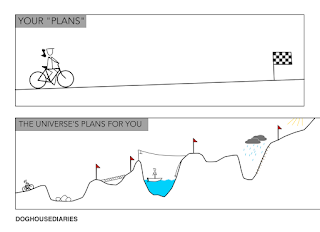 Peaks, valleys, obstacles will undoubtedly lie on my path - not that nice straight line that I think Life should be like - might mean I don't meet my initial goal. But if I never set a goal, a deadline, I will never get anything done. Yesterday I wound a couple of warps, this one included, but didn't even try to dress the loom. I was tired and that is a recipe for mistakes happening. 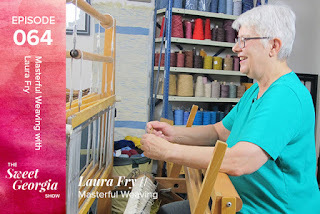 As it was I was distracted and had to stop several times and recount my ends to make sure I was winding the warp accurately. I'm ready to weave, but rather than carry on while tired, decided to just wind bobbins so that I can start weaving tomorrow, hopefully when I'm better rested. The show has been...ok...but after last year's success, disappointing. Today it is supposed to be more typical Vancouver weather with rain all day. That may help because it won't be very nice to be out of doors. Plus today is the last day so if people want something, today is the day. This show has about 300 booths. The vast majority of us either earn our entire income from making and selling, or at least the income forms a significant portion of our income. If we don't make enough, then we have to make decisions. It is never a good idea to make such decisions while disappointed and tired. So I will wait until later in the month after I've been home for a while and can crunch numbers, look at the calendar and do some thinking. In the meantime? One more day. Today begins day three of a five day show. It's the last of three, back to back. I've been doing this show (this time around) since 2011. It's a high end show that attracts interesting makers and a clientele that, for the most part, is willing to pay 'extra' for hand made designer items. Over the years I have developed a small following and a number of them have let me know that they appreciate what I make. Some have even added to their collection. It is always heart warming to get this kind of feedback. But the years have taken their toll. My body has been having...issues...for a number of years. Each year I sit down at the end of the season to assess how the shows have gone. How much in sales? How much physical effort it takes? How much inventory I have left vs how much stash? At this stage of my life doing three shows back to back is no longer a given. Each year I have to think long and hard about whether or not I can do it again. In the meantime I also have the on line 'shop' on the Circle Craft website, which I expect to rejuvenate next week sometime. I need to sit down with my iPad and make a list of what needs doing and set myself some deadlines/goals. Because the conference is about to get real, too. It has been quite the year. 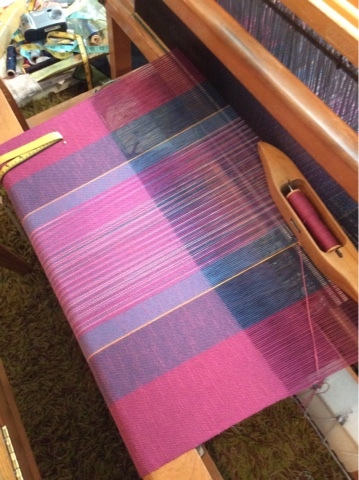 It started with this warp. Then I kind of stumbled my way through the months. My goal was to use up stash, and in that regard I did succeed in using up some of my yarns. But I didn't make the things I really needed. So I am 2/3's of the way through my craft fair season, having done two out of the three major shows I am doing, low on shawls and place mats. I always seem to under estimate how many mats I need. 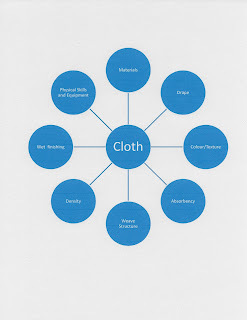 As for the shawls? I just didn't have the energy. Another way to look at my season is that I have done five of the 10 sales days. So, reckoning that way, I'm really only half way through my season. As a craftsperson I work all year getting inventory ready. Bills come in, money goes out. And hopefully these three shows will be my 'pay day'. But you never really know how things will go. So...plan B is to get home, take beauty shots, update my 'shop' on the Circle Craft website. Because I'm pretty sure there will be tea towels left over at the end of this fair. 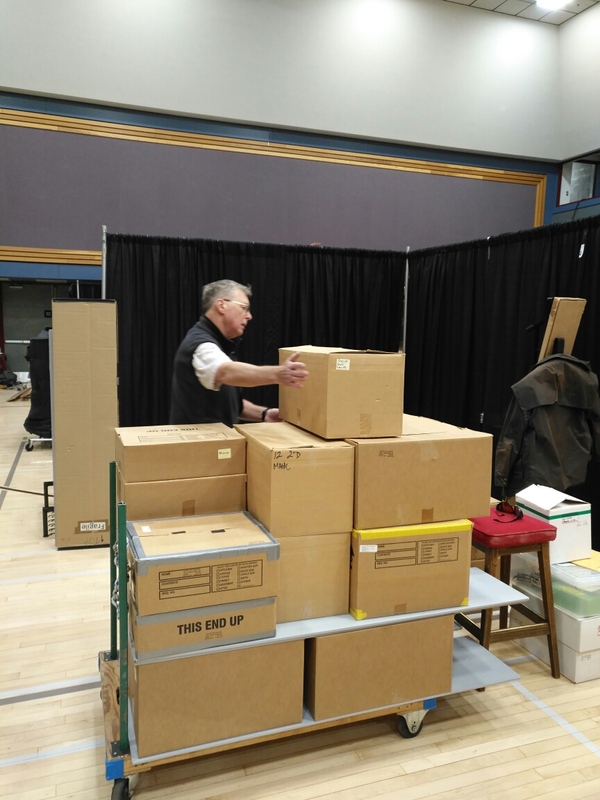 Yesterday was set up day for the other local show we do - Studio Fair. I have been doing this show, first as a volunteer, then as an independent crafts person for a very long time. I've watched it grow into the higher end show it now is, attracting artisans from across the country. I've been here almost every year it has been in business, watched others - and myself - evolve through the decades. We have refined my booth structure and display as what I make has changed. Most of it fits on a cart other than a few 'odd' items - like the tall stool and some metal display stands. Usually while Doug loads the cart I start hand carrying the odd ball items to the booth. And then we start setting up the booth apparatus, including the lights. Studio Fair is a 'low light' show but even before it was I always had my own lights. Because the quality of light in such large halls is pretty terrible, which would shift my colours into something...not very attractive. I needed my own lighting to wash out the overhead lights so that people could see how my textiles actually looked instead of how they looked under the hall lights. So this photo shows Doug just after he has arrived with the loaded cart. A couple of boxes are already on the floor - the cart is usually piled high with display stuff as well as the many boxes of product. It all fits into the back of our 'mini' van with the seats out in the back. Now it's down to whether or not enough people are interested in my designs, willing to pay my prices. Sunday we tear down and pack everything up into the back of the van. Monday morning, as soon as we can possibly hit the road, we head for Vancouver to do the Circle Craft Christmas Market. 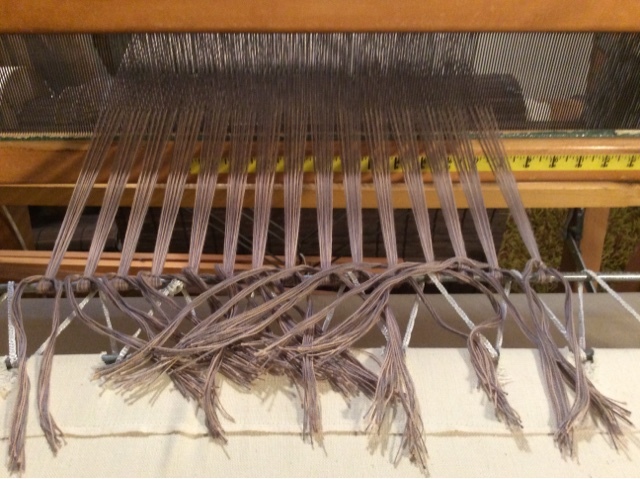 People sometimes forget that for me, weaving is a year round, full time job. And so when I appear at a craft fair, the contents of my booth do not reflect just a few weeks or even months of work, but at times, years. Since I have never yet actually sold out of anything in one year, whatever is left gets brought out the next year. And the next. Until I get sick of dragging it around and donate it to a worthy cause, or sell the last few pieces of a line at discount prices, usually at the annual guild sale in December. It's a great way to support the guild (who gets a % of sales) and get rid of things that have been hanging around for far too long. 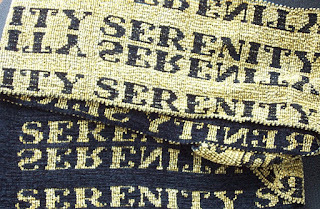 Some of the things in my booth might have been woven five years ago; some were woven this year. 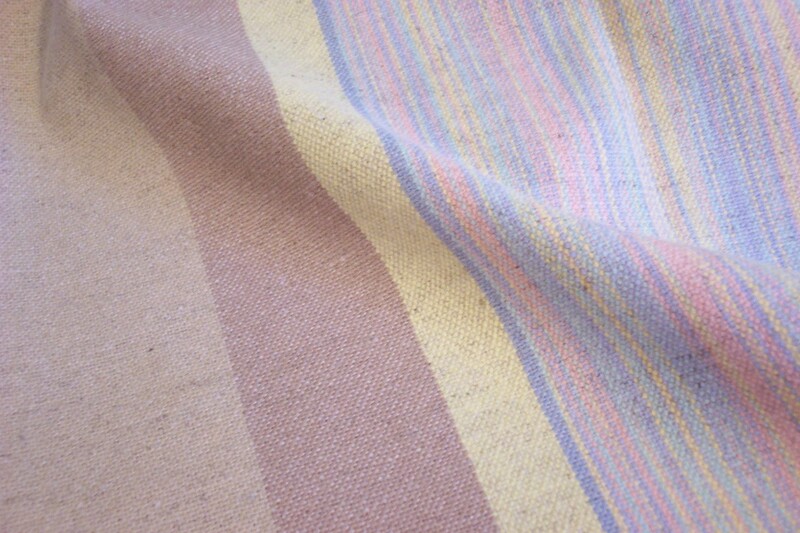 Weaving by hand is still a labour intensive activity. People constantly want to know how long is has taken me to weave something. Which is very difficult to say without doing some serious number crunching. 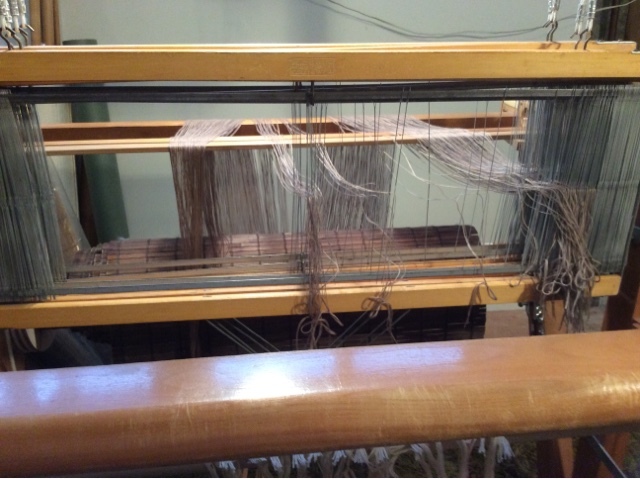 It takes about 30-40 minutes to wind a warp which will yield 12 mats and one table runner. It takes about 10-15 minutes to sley and tie on. It take about 30-40 minutes to weave 4 mats, so a total of about 140 minutes plus breaks to weave that warp. 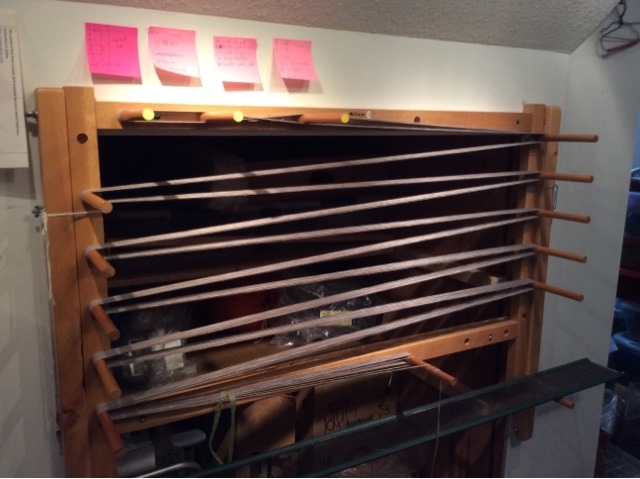 If I push hard I can weave the entire 10.5 meter long warp off in a day. Cut and serge? About 30 minutes. Then into the washer and dryer. Then a couple of hours to press. 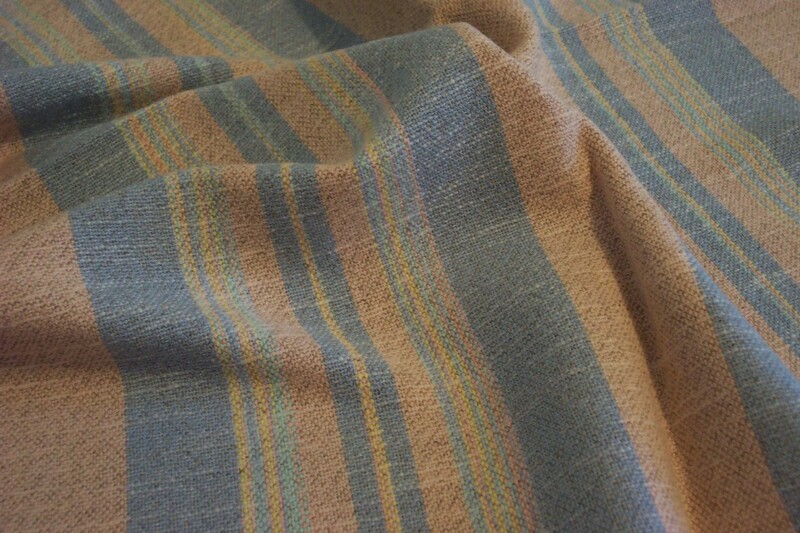 Hemming takes about 40 minutes each. Yes, finishing an item can take as long if not longer than weaving (as in shuttle throwing). And I'm fast. 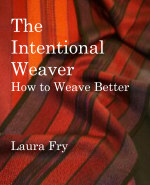 Most weavers can't come close to my efficiency. Yes, people can buy place mats for cheaper at Target. But they won't get my designs. Because in the 21st C what hand craftspeople are selling - in addition to their skill - is their unique design aesthetic. Something that cannot be found anywhere but from them. For all the people who have believed in me and my skills/designs over the decades - my heart felt thanks for supporting me in my dream of creating unique textiles. We set up for Studio Fair tomorrow, set up for Circle Craft Christmas Market (Vancouver) next Tuesday, and once I get home I will be re-opening my shop on the Circle Craft website.